I have a SharePoint Online Site Classic team site template. I also have 1 blogs site as subsite underneath it. On top level site i am using content query webpart to publish blog items from blogs subsite. Now i am trying to assign users to add comments on the posts. To do that i went to blogs site --> Site Contents--> Comments--> Lists Settings-->Permissions for this list. On that page i broke inheritance and assigned visitors group a contribute access. When i did that xslt webpart on top level site bombed. It triggered following error. The "XsltListViewWebPart" Web Part appears to be causing a problem. Unable to find the specified file. I dont know why this is happening, I have implemented this in SharePoint 2013 onprem no problem. Why is Sp online acting the way it is. Any way to mitigate this issue? This error can occur when the blog's Comments list has unique permissions to enable people to post comments but not edit news blog content). 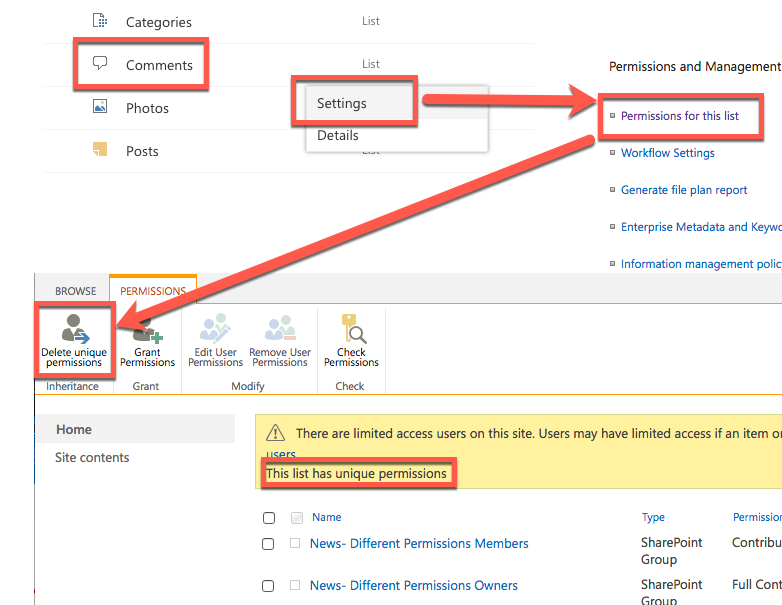 It may also occur if there are other list-level unique permissions on the Blog Site. In our case, removing the unique permissions from the Comments lists fixes the error, but of course disables the ability for viewers to comment. The "Like" feature is unaffected and remains. Not the answer you're looking for? Browse other questions tagged sharepoint-online content-query-web-part xslt-list-view-web-part blog or ask your own question. Where can i find 'posts' web part? XSL: How can I personalize Content By Query Web Part? How to add listview webpart to subsite, while list is available in top level site?